Two nights, two concerts. One venue. 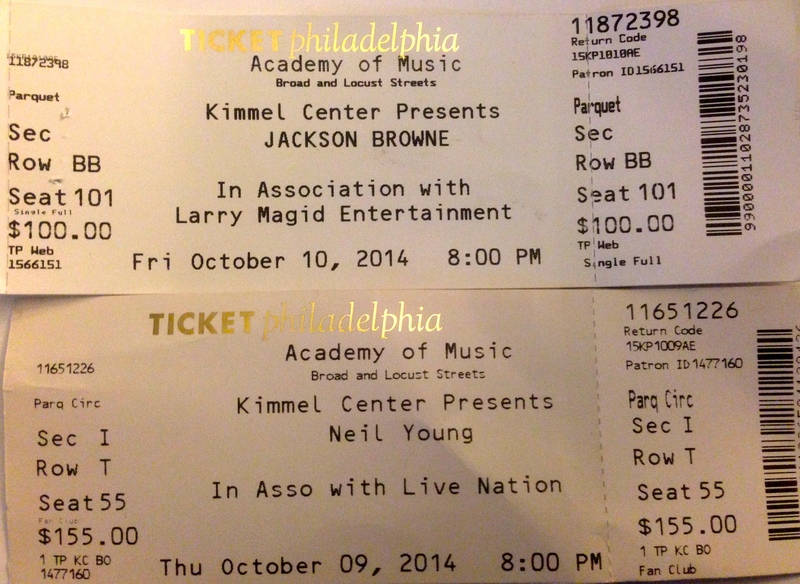 On Thursday, Neil Young delivered a spellbinding acoustic show at the Academy of Music in Philadelphia. On Friday, Jackson Browne and a crack band gently rocked the same house. On the surface, the differences couldn’t have been more stark. Neil, at 68 years of age, looks like a grizzled miner, albeit one for a heart of gold. He possesses a stage demeanor that is, in a word, gruff. He ignored the shouted requests (typical for a Philly crowd) for obscure and not-so-obscure songs from his decades-deep catalog and, at times, seemed visibly annoyed. “CSNY!” someone in the balcony yelled. “Never again,” Neil snapped. “Crazy Horse?” someone in the front row queried. “Always,” he replied. Jackson, on the other hand, looked decades younger than his 66 years; and fended off the shouted requests with aplomb and humor, jokingly wondering if he’d selected the right songs for the setlist. At one point, as he prepared to play a song from his new album, the excellent Standing in the Breach, someone shouted out for an old song – and he swapped his guitar, huddled with the band members and then served up “Your Bright Baby Blues” from The Pretender. Yet, appearance and stage patter aside, they share many similarities. They’re both singer-songwriters with long resumes who, at their best, craft songs that caress and/or express the heart and soul; they’re each comfortable on stage alone or with a band; and they’re passionate about defending the environment. Neil performed “Mother Earth” and the new “Who’s Gonna Stand Up (and Save the Earth)?”; and shared his disappointment with President Obama for signing off on deep-water fracking in the Gulf of Mexico. Jackson, for his part, discussed the need to save the oceans – every second breath we take is thanks to them – prior to performing the new “If I Could Be Anywhere,” a wonderful song from Standing in the Breach about a trip he made to the Galápagos Islands. They also split their concerts into two sets. People who know me in the real world know that, when push comes to shove, Neil Young is my favorite musical artist – his music is ingrained in my DNA. Yet, as I’ve written elsewhere, the older I’ve become the more I’m drawn to the work of Jackson Browne – especially Late for the Sky, which now easily ranks in my Top 10 Albums of all time. Since Friday night, I’ve been comparing and contrasting the two concerts in my head, and – beyond the superficial – coming up with blanks. Neil’s was, as I said at the outset, spellbinding. Jackson’s was a little less so, yet some of his songs (“Rock Me on the Water,” “Fountain of Sorrow” and “For a Dancer”) resonated deeper in my soul. Read into that what you will. That is quite the back to back concert experience, Jeff. I recall following on Thrashers Wheat the Neil Young solo shows. Neil gets crotchety. When I saw him in Bridgeport he admonished two female fans who kept texting during his set. He mimicked them and I think he threw water on them. I like Jackson’s set list. Cool reviews. Thanks for the videos and insights.